Team Fall in the red corner versus Team Spring in the blue. 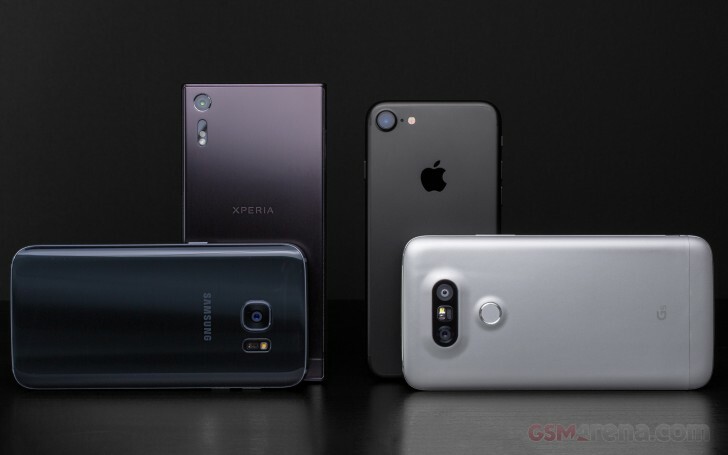 Okay, not really - it's actually every phone for itself, but the newly-launched contenders from Sony and Apple take on the established players from Samsung and LG that have been around for some six months. The Sony flagship we've all been anticipating since the introduction of the X-series is finally here. The Xperia XZ brings further refinements to the 23MP shooter introduced with the Xperia Z5 and its siblings, adding a laser autofocus to phase and contrast detection, and a dedicated sensor to assist with picking the proper white balance. What the Xperia XZ lacks is optical image stabilization - even the iPhone has that box checked this year. Indeed, the iPhone 7 is the first generation small-sized Apple smartphone with OIS - up until now the feature could only be found on the Plus-sized models. That's not the only upgrade over the iPhone 6s' cam, though - you get much faster optics (f/1.8 vs. f/2.2), marginally wider FOV (though at 28mm-equiv it's not particularly wide) and a 4-LED flash. When it comes to 'wide' there's no beating the LG G5 and its 8MP 135-degree FOV wide-angle rear camera. However, that's quite a specialty tool - for general shooting you have a proper 16MP f/1.8 wide-ish 29mm cam with laser autofocus. The Galaxy S7 takes a different approach to the focusing race and has a phase detection sensor at each pixel - a total of 12 million phase detection agents. Beat that, triple-hybrid Sony! The Galaxy S7 also boasts the widest aperture of the bunch, though the difference between f/1.7 and the f/1.8 of the others is marginal. So, yeah, going by the numbers and the checkboxes there isn't one camera to rule them all. We grown-ups know that life is all about compromise and we're determined to find out who does what best. Join us on the next page for what should be the easiest task - still images in daylight. hi , i have a LG G5 , it camera is so nice.